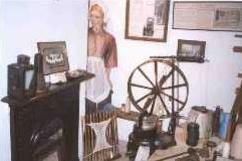 Situated on Main Street, next door to the Baptist Church, is a Folk Museum dedicated to Victorian Calverton. Inside, this old Stockinger's cottage, there are four rooms dedicated to the periods furniture and clothing, fossils and kitchen, living room and bedroom exhibits. 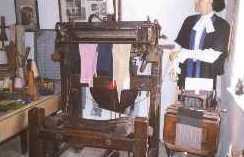 Also on display is an actual Frameworker's knitting machine. As started here, way back in the 16th Century, by William Lee. Tapestry pictures of village buildings can also be found on display. A taped commentary is included in the tour. 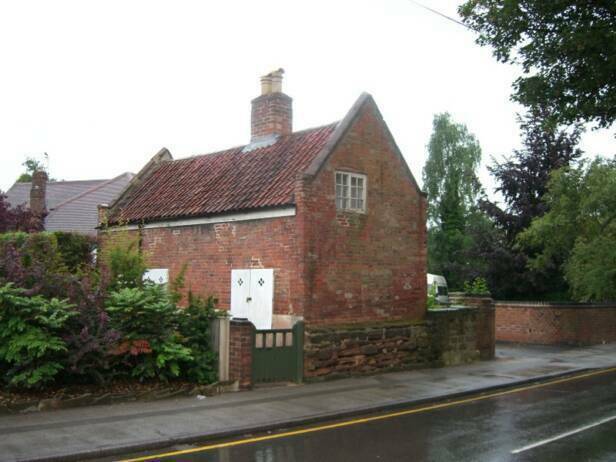 The Calverton Folk Museum was created from a four-roomed derelict cottage which somehow escaped demolition when many of Calverton's vernacular buildings were sadly bulldozed. 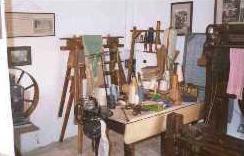 In it we have endeavoured to create the atmosphere of the davs when a stocking frame was the lifeline of a man and his family. All members of the family had to work. Even at the age of 9 years little girls had to seam and boys melt the zinc and lead for the needle molds. Visitors to the museum are amazed at the hard life people endured - brick floors, darnp walls, smoky chimney. Water had to be carried from a well many yards away. If you visit us we can show you these things. Beautiful work was produced on the hand frames which were set next to a window. Illumination at night was provided by a paraffin lamp or candle set behihd a glass globe filled with spring water and Aqua Fortis which provided magnification across the needles. One resident remembers, as a twelve year old girl, working on her father's frame and also recalls that he once made stockings for Queen Victoria. Many of the stockings, gloves and undergarments were sent all over the world, patientlv created for a pittance bv a man and his family, living often in overcrowded conditions. 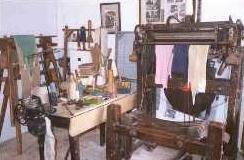 ​Many artefacts relevant to the industry have been given to the museum and are on display with the stocking frame. Open on the last Sunday of every month April to September from 2p.m. to 4p.m. Other times can be arranged if required. £1.50 for Adults (senior citizens, the jobless and the disabled) 50p for Children (16 years and under). From Nottingham City centre catch either the CC or the C7 bus from outside Department store on Old Market Square. Free parking is provided and toilets are close by at St Wilfrids Square (2 minute walk).